It’s been a busy week at the Michael Jordan Collision Center in Durham, NC. Michael Jordan Collision 2016-04-01 from Eddie Gontram on Vimeo. Metal stud framing is now complete on the interior, and electrical wall rough-in is also nearing completion. Plumbing rough-in finished earlier this week. On the exterior, the new oil-sand separator tank (2,000-gallon concrete vault) was installed under the front parking lot. Given the amount of rock encountered in other areas, we were relieved this installation went fairly smoothly. A new sidewalk and steps was formed and poured to connect the Upper Level with the main entrance at the Lower Level. Finally, the paint booths arrived and are about 50% complete. They should be finished by the end of next week when the prep decks arrive. Michael Jordan Collision Center Timelapse 2016-04-01 from Eddie Gontram on Vimeo. Two months to go at the Michael Jordan Collision Center project in Durham, NC. The interior concrete work is now complete, allowing metal stud framing for the customer and office portion of the project to begin. The 30-foot high stud walls were the first to be installed. New high windows along the south side of the building were framed and trimmed out. The wash bays on the Upper Level were poured, allowing for the masonry wing walls to be installed in a week or so. The front entrance canopy and ADA ramp were poured. LED high bay lighting has begun in the Lower Level. Next week, more exciting work continues as the paint booths are delivered and installed, and the 2,000-gallon oil-sand separator will be installed below the front parking lot. Structural steel for the new canopy entrance area is also due early next week. Demolition is nearing completion for the Michael Jordan Collision Center in Durham, NC. Walls are down, plumbing fixtures, ceiling and unnecessary ductwork have been removed. The existing fibrous spray-on fireproofing that was originally installed years ago is no longer necessary since we are sprinklering the building. We are going through the pain-staking, laborious process of scraping all of the structural steel to remove the fireproofing and paint the steel since the substance would otherwise be a continuous dust and maintenance problem. On the exterior, construction staking is underway. Next week tree protection fencing will be installed and rough grading behind the building will begin. A new rear driveway is being installed to provide at-grade, thru-building access. Michael Jordan Collision Center Underway! In yet another example of the turnkey Architect-led Design-Build delivery method so popular with our clients, Gontram Architecture and Ten Penny Construction announce the commencement of construction of the new Michael Jordan Collision Center in Durham, NC. This project represents the culmination of a 3-year process of investigating several potential sites and existing buildings to examine the feasibility of locating a collision center near the existing Michael Jordan Nissan dealership. 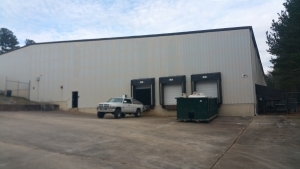 Many greenfield/brownfield sites and existing buildings were reviewed, finally settling on this existing medical records warehouse just a few miles away from the dealership. 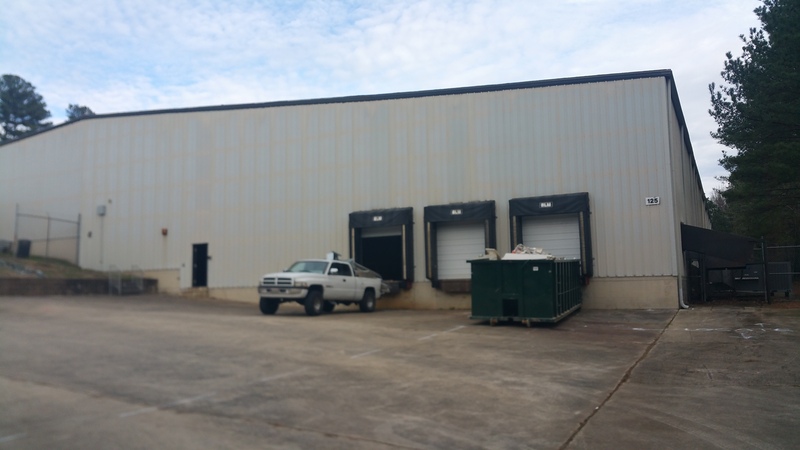 This project involves renovating the existing warehouse for the collision center and indoor storage of new cars. The split-level building is situated on a steep slope, tight site. For the collision center, a new customer area will be constructed, with reception area (with complete view of shop area), offices, restrooms, and other administrative spaces. The shop area will house shop bays, metal bays, prep deck areas, and paint booths. On the exterior, a new drive around the rear of the building will provide service circulation as well as at-grade access to both levels of the building. One of the more challenging aspects of the project will be adding an NFPA 13 sprinkler system to the building, currently unsprinklered. (An auto body shop of this size is required by Code to be equipped throughout with an automatic sprinkler system). A new 12″ fire line will be installed along the long driveway to the building. In addition to the sprinkler requirements, many plumbing, mechanical and electrical requirements associated with body shop equipment and operation. As part of the electrical package, all new lighting will be CREE LED fixtures to provide substantial energy and long-term maintenance savings. Finally, a new “front porch” entry feature will be installed to provide a more commercial, retail and professional feel to the warehouse building. Construction is anticipated to be complete in June, 2016. Ten Penny Construction teams with Gontram Architecture to deliver commercial projects via the Design-Build process. Our unique process of architect-led design-build makes our Clients’ lives simpler by providing design and construction from a single source. The fact that we are architects and contractors gives our clients the distinct advantage of early budget confirmation, and the virtual elimination of surprises, delays, change orders, and cost overruns. In the traditional Design-Bid-Build process, clients hire an Architect, who then designs the dream project for the Client. It is then put out to bid to multiple general contractors, who provide a price, that may or may not be within the project budget, but is guaranteed to be ripe with potential change orders, surprises, and budget busters in the end. It is a contentious process that puts the Owner between the design team and the construction team if a conflict arises, with multiple parties pointing fingers at each other. In the Architect-led Design-Build process, everything is provided to the Owner thru a single-source, team approach. The Architect and General Contractor work together from Day One to provide a successful project, within an initial budget, within the time allotted, and with no surprises. And with a single source for design and construction, the owner doesn’t need to worry about playing referee. At Ten Penny Construction, we make the complicated and stressful process of commercial design and construction predictable, economical, and enjoyable. We’d like to help you with your project! You can find out more about our process by downloading our FREE GUIDE.